Print Directory | Search Celebrity Database | Free Trial! Unlimited Celebrity Searches – Contact 59,000+ celebrities, influencers & public figures; 14,000+ representatives (agents, managers, publicists & attorneys) plus 7,000+ entertainment companies 24 hours a day, 7 days a week using our Private Online Database. Now you can contact celebrities directly! Up-to-Date Celebrity Contact Information – Every celebrity listing includes each celebrity’s verified mailing address, agent, manager, publicist, attorney, production company & charitable cause along with representative names, phone number & email address so you can get in touch with celebrities by mail or email! Cross-Referenced Search Results – Each celebrity’s record is cross-referenced & cross-linked. Click on a company to see its address, phone & email contacts plus staff members. Click on a staff member for his or her mailing address, phone & email, plus a list of celebrities he or she represents. Then click on a celebrity’s name to get his or her contact information delivered with our lightning-fast celebrity contact list & database directory. Daily Database Updates – Our Celebrity Contacts Database is updated daily, allowing you to see changes & new additions as soon as they’re added. Other sites offer outdated celebrity addresses, but with our Dynamic Lookup Technology, you’ll always up-to-date! Free Research Requests – Can’t find a celebrity you’re looking for? Just let us know. 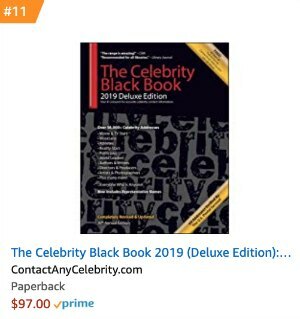 We’ll research the celebrity’s contact information and update his or her information in the online celebrity contact directory, usually within 24-48 hours. Save time, money & energy by letting us do your research! Postage Refund Guarantee – If any letters are returned to you by the post office, simply mail the envelopes back to us. We’ll cut you a Postage Refund Check for fifty-cents per return. Never waste money on postage by sending mail to outdated celebrity addresses – your Membership pays for itself! This is perfect for charities, fundraisers & nonprofits. Celebrity Causes Database – Discover which celebrities contribute time & money to your charitable cause. Just choose the category of your cause from the celebrity contact directory and you’ll get a list of celebrities who are known to donate. A great resource for charities, fundraisers, and nonprofits. Live Customer Service – We specialize in customer service for our Members. Feel free to contact your Member Concierge anytime to ask questions about a celebrity’s contact information, a research request, or to update your account. World-Class Membership – You don’t have to be famous to use Contact Any Celebrity, but that doesn’t stop some of our Members. Just look at our VIP Client List! Bonus Books, Insider Interviews & Special Reports – Join now and you’ll get Instant Access to our exclusive ‘how to contact celebrities’ e-books, Secrets to Contacting Celebrities: 101 Ways to Reach the Rich & Famous; Celebrity Leverage: Insider Secrets to Getting Celebrity Endorsements, Instant Credibility & Star-Powered Publicity; Help from Hollywood: How to Hold a Celebrity Autograph Auction and Raise Tons of Money for Your Cause and The Lost Secrets of Fame & Fortune: How to Get (And Keep!) Everything You Desire. ($75.00 Value!) Download them from the Private Member Lounge as soon as you join. 5-Star Satisfaction Guarantee – If for any reason you’re not happy with your Contact Any Celebrity Membership, let us know. We’ll either fix the problem to your satisfaction or issue a full refund, your choice. There’s zero risk – we want you to be happy! Activate Your FREE 7-Day Trial! What is Contact Any Celebrity? As soon as you join Contact Any Celebrity, you’ll get instant, unlimited access to our Private Online Database of 59,000 celebrity contacts. These celebrity contacts include the verified mailing address, agent, manager, publicist, and production company (if applicable) plus email addresses and phone numbers of their professional representatives. You also get monthly Insider Expert Calls, Free Research Requests, our famous Postage Refund Guarantee (see below) and more. 97%. Celebrities move and change representation daily, so we can’t be 100% accurate, but we try! We’re always researching trade publications, making phone calls and getting client lists from top talent agencies, management companies, and public relations firms. Do you provide personal contact information? When you join Contact Any Celebrity, you’ll get each celebrity’s agent, manager, publicist, production company, attorney, and charitable cause(s). We don’t provide personal phone numbers or email addresses (though we do have some). We provide celebrity home addresses unless the celebrity or a representative asks us to remove it. What if I can’t find who I’m looking for? Let us know! We’ll research the new information, update the database and let you know what we find! Everyone from New York Times bestselling authors (Tim Ferriss recommends us twice in The 4-Hour Workweek) to 501(c) charities and nonprofits to Shark-Tank-like marketers and small businesses. Oh, also fans and autograph seekers, real estate agents, event producers, journalists & media interviewers, podcast hosts and more! Contact Any Celebrity Membership is $47/month or $197/year if you choose to pre-pay. All plans come with a FREE 7-Day Trial. Why do you require a credit card? We require a credit card because of the number of children and teenagers we get who want to contact a celebrity. A credit card verifies that you are at least 18 years old and prevents unauthorized use of our site like stalking or harassing celebrities. We know where to find you! We sure do! If you’re not happy for any reason, just let us know. We’ll fix the problem to your satisfaction or issue a full 100% refund. We want you to be happy! What if I do a mailing and get returned mail? Send any returned-to-sender envelopes back to us. Per our famous Postage Refund Guarantee, we’ll cut you a check for fifty-cents per return, plus the cost of sending them back to us by U.S. Mail. We’ll also research the celebrities’ new contact information, update it in the database, and let you know what we find! Activate your FREE 7-Day Trial, then check out our How-To Articles and Blog for tips, tricks, and tactics.